Put this Sunday pork roast on your dining list. To call a dining experience essential, it must have both a sense of place as well as a phenomenal taste. 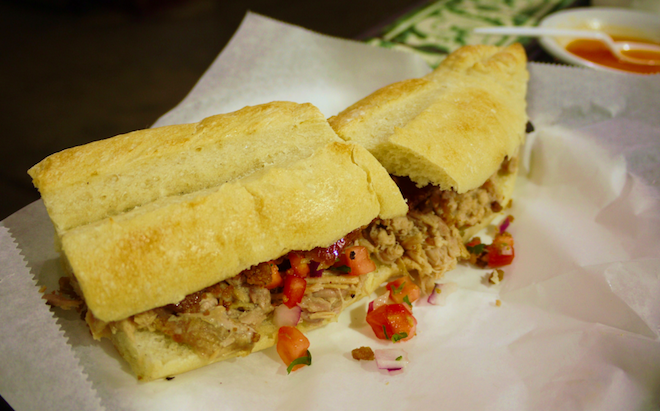 The Sunday pork roast at South L.A.’s Mercado La Paloma complex fits this bill. Each week, chef Gilberto Cetina of Chichén Itzá roasts a whole suckling pig, Yucatan-style with bitter orange—and it’s worth the trip. The complex has survived the departure of chef Ricardo Zárate’s Mo-Chica (which is now located downtown). While the outstanding Oaxacan juice bar and café has kept locals happy, Chichén Itzá, which is one of L.A.’s few chef-driven, traditional Mexican restaurants, continues to draw in visitors from all over town. Chef Gilberto Cetina and his son, chef Gilberto Cetina Jr. are cookbook authors of Sabores Yucatecos: A Culinary Tour of the Yucatan, and they’ve been dishing out polished presentations of traditional Yucatecan plates since 2001. On Sundays, they roll out the golden crisped whole carcass of lechon al horno, or suckling pig to be served in tacos, tortas, or plates. The whole thing starts early, at around 8 a.m. Yes, you were bar-hopping last night, or had a late reservation at one of the hot new restaurants in town, but you’ll be rewarded for stumbling out of of bed. Nothing cures a groggy head like juicy, young pig. Tacos de lechon are amazing, and no one would fault you for ordering a full plate, but, “I’d get the torta with our housemade pan frances (a soft, French baguette-style roll),” says Cetina Jr. It’s simple and luxurious: flavorful suckling pig with crackling, browned skin, a little pico de gallo, and that delicious bread. And, of course there’s habanero salsa—regular or roasted—for a painfully delicious Sunday morning wake up call.